VOLUNTEER TRAPPING AND HAND CATCHING Manual. These instructions give you as much information as we can about the best way to use Frogwatch traps and hand catch cane toads as a part of a volunteer cane toad control program. A combination of trapping and people picking up toads is the most effective way (at present) to eradicate toads from an area. The traps can be set to catch toads all night without supervision. 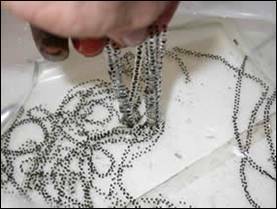 The clear fingered trap mechanism and the cage trap developed by FrogWatch have shown significant results as a device to capture cane toads. The one-way gate utilises clear plastic fingers that allow the toads to see into the trap and allows them to easily push into the trap. Once inside the trap the toads cannot get out again. The one-way gate can be fitted to any sort of cage or pen design. Multiple gates can be fitted to a cage trap. Small cage traps can be easily moved around to the best location to catch toads. One small cage trap 400mm wide X 600mm deep X 300mm high, with a single gate, has caught over 100 toads in a month in trials near Katherine. The toads are attracted to a light or the insects that are attracted by the light. To feed on the insects the toads need to go into the trap. The gate exploits a behavioural characteristic of the toads, pushing against any barriers in their way, by allowing them easy access to the inside of the trap where the insects are. Traps of various sizes can be used in different roles in a control program. When you set up a Frogwatch trap the light source needs to be on top of the trap or close to it. If your cage trap is small there is a risk that toads will sit around the outside and get a feed without going into the trap. To stop this cover the sides of the trap where there is no gate with shade cloth or plastic. This should make the toads go to the parts of the trap where the doors are. Make sure the mesh is large enough to allow insects into the inside of the trap. The size of the holes in the mesh allows other animals, such as small native frogs, to pass through the trap. Positioning traps is a key part of their use. Close to the edge of water bodies is the most effective place but it needs to be remembered that not all toads will be in that locality on one night. During the Wet season females tend to stay away from these areas probably to avoid being hassled by male toads all the time. Setting traps 50 metres from water increased the capture of females during the wet season. In the dry season, females come to water, increasing their vulnerability to traps and other control methods. Toads are quite mobile animals and they move around a fair bit. This means they are likely to find the trap if it is in the open. In the natural bush environments, the edges of billabongs and wetlands are ideal places. As the water recedes in the dry season traps can be set on the clear ground previously underwater. In times when there are lots of insects or in periods of cool weather toads may not move so far from their day refuge sites. In this instance setting traps close to the refuge point can be more effective. If setting traps near rivers, place them on very gentle sloping open banks for the best chance of success. 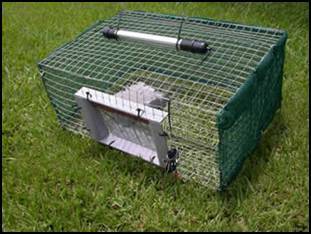 With a water supply and cover, the traps can be left long term without the need for checking. Toads live happily in the traps and feed each night when the light is on. Pitfall traps have been successfully used as well but need to be closely monitored as they catch a range of other animals as well. So for an overnight stay at a bush camp where people can closely monitor the trap, this is ideal cheap option for the casual camper. The Frogwatch traps have been used successfully with ordinary 12volt camping fluorescent lights. They have also been used very successfully with 12v black light insect tubes which seem to attract more insects. Black Light Disco or Black Light Blue lights seem to be most effective. Any light source that is bright enough to attract insects will probably work. Solar panels can support these lights over long periods in the field. However, solar panels are costly and require some supervision to avoid loss of this expensive resource. Note too many insects can be attracted to smaller traps. Once the ball of insects gets bigger than the trap the toads do not need to go into the trap. It may be necessary to use lower powered lights in periods when there are lots of insects. Cane Toads will have a line of sight. Thus, the traps need to be visible from where they are in order for the toads to find the trap. Setting a trap in long grass reduces the effectiveness. Northern Frogwatch usually clears the area around the traps using a whipper snipper or sets the trap in areas of clear ground or short grass. A second light elevated in the air will increase the traps’ effectiveness in long grass. Where possible toad musters should always be used to supplement the effectiveness of traps. Cane Toads are generally not poisonous or dangerous to handle. However, avoid any contact with the poison, which is exuded from the parotid gland behind their ears. The poison is only exuded by the toad when acutely stressed and is occasionally squirted from the gland. Hands should be washed carefully after contact with the toads and it is preferable to wear gloves when catching and handling the toads, as they can also carry salmonella and other bacteria. Use strong thick plastic bags (not easily holed) to collect toads that are hand caught in the field, because the toads jump out of buckets or similar containers. should be formed into groups to sweep areas in a line. 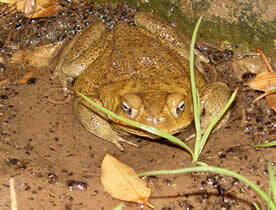 Toads are fairly obvious at night as they sit in open areas and congregate on the edges of wet areas. They also may collect away from water. On one toad bust, several cane toads were found together under a caster oil bush well away from the water body. long water bodies, such as the Victoria River , using debris as rafts. In camping grounds we have found them near ablution blocks, under leaking taps, and cleared grassed areas. They are much more easily found at night as they are night feeders. Eggs and tadpoles are more likely to be found in still shallow water, often wrapped around vegetation. Unlike native frog eggs, the cane toad eggs are in long strings that are easily picked up as strings in the first days after they have been laid. It is like pulling fishing line out of the water, unless they are close to hatching and the connective tissue breaking down. It is important to repeat operations in one area as you are unlikely to get all the toads on one night. On any given night some toads will be re hydrating, others will be feeding or in refuges. On nights when toads are calling large numbers of male toads can be collected around water. When toad mustering is taking place near crocodile infested waters if is important to know who your partners are on either side of you and to always be aware of the danger. Luminescent arm bands should also be worn for further safety measures. On a Toad Muster it is important for the individual to ensure they have a strong torch with back-up batteries. And good walking shoes or boots. It is important for leaders of each mustering group to carry a whistle. Strong spotlight with back-up batteries. Satellite Phone. First aid kit. And a Handheld radio with communication to the Back-up Charlie in the muster sweep. 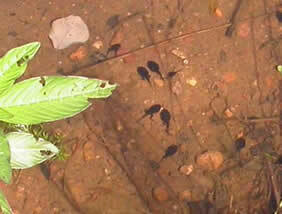 Eggs, tadpoles and small metamorphs can be scooped up from water bodies and left to dry on dry land. 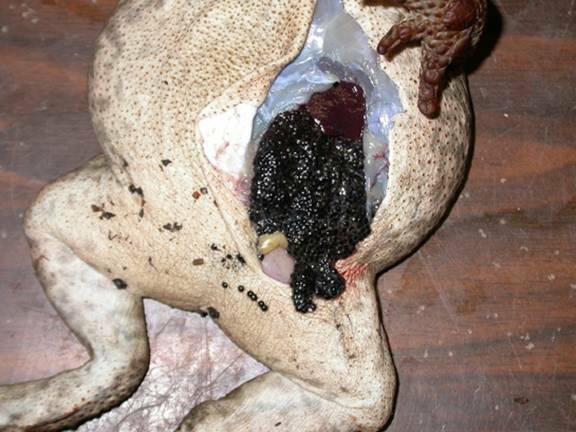 Cane Toads can be placed in a strong well sealed plastic bag and gassed with CO2. After 30 minutes the cane toad can be removed and buried. It is important to watch for other wildlife that pose a safety risk to toad catchers. Cane toad habitats are also snake and crocodile habitats. When toad busting always move with suitable clothes and footware, a strong light that permeates water bodies and shows the eyes of crocodiles, backup light and a companion. A Leader and a Back-up Charlie, each carrying a two way radio for communication. A leader carrying a satellite phone and first aid kit. Every toad buster should wear a luminescence arm band if possible. Total awareness of group strategy (collecting eggs/tadpoles/trapping and monitoring/recording information etc etc) and at all times be aware of who and where your companions are situated. Do not wander off on your own. Sun protection cream and broad brimmed hat if working during day. Sock protectors and fly net. Clarity re-meeting arrangement with wider group. Note: If anyone at any time loses sight of the toad busting team, move away from the waters edge to higher ground and remain stationary until found. Use the torch light sparingly to conserve battery. Learning to ‘coooeee’ in a situation like this can lead to discovery very quickly. These instructions are to give you as much information as we can about the best way to use the traps and hand collection as a part of a control programme. A combination of trapping and people picking up toads are the most effective way to remove toads from an area. Remember……….